This edition has been modified for use in schools. Questions have been added to the summaries, and display options have been modified. From Hans Andersen's Fairy Tales, Second Series, edited by J. H. Stickney. Illustrations by Edna F. Hart. (Translator not identified.) Ginn and Company (Boston, New York, Chicago, and London) 1915. Available at Project Gutenberg. 1 The world beneath the sea. The royal family. 5 She pines for the young prince. She finds his castle and observes him. 10 The sisters can save the Little Mermaid. But she will not slay the prince. 11 She sees the bright sun. She has joined the Daughters of the Air. 1 Very deep in the ocean, where the water is very clear and beautiful, the Sea King rules his kingdom. 2 His mother, very sensible but exceedingly proud, keeps house for him. She cares for the King’s six daughters. Q Do you agree with the statement, expressed above, that the grandmother was proud? Look below to find an answer to this question. 3 They are beautiful, especially the youngest. They play in the castle or the garden and pet the fish as they swim by. 4 Each princess has her own plot of ground in the Royal garden. Q Do you know any family with six children, all female? Did H.C. Andersen make an artistic mistake by doing this? ▲1 Far out in the ocean, where the water is as blue as the prettiest cornflower and as clear as crystal, it is very, very deep; so deep, indeed, that no cable could sound it, and many church steeples, piled one upon another, would not reach from the ground beneath to the surface of the water above. There dwell the Sea King and his subjects. ▲2 The Sea King had been a widower for many years, and his aged mother kept house for him. She was a very sensible woman, but exceedingly proud of her high birth, and on that account wore twelve oysters on her tail, while others of high rank were only allowed to wear six. She was, however, deserving of very great praise, especially for her care of the little sea princesses, her six granddaughters. ▲3 They were beautiful children, but the youngest was the prettiest of them all. Her skin was as clear and delicate as a rose leaf, and her eyes as blue as the deepest sea; but, like all the others, she had no feet and her body ended in a fish's tail. All day long they played in the great halls of the castle or among the living flowers that grew out of the walls. The large amber windows were open, and the fish swam in, just as the swallows fly into our houses when we open the windows; only the fishes swam up to the princesses, ate out of their hands, and allowed themselves to be stroked. ▲4 Each of the young princesses had a little plot of ground in the garden, where she might dig and plant as she pleased. One arranged her flower bed in the form of a whale; another preferred to make hers like the figure of a little mermaid; while the youngest child made hers round, like the sun, and in it grew flowers as red as his rays at sunset. 1 While her sisters collected treasures from wrecked ships, the youngest cared only for flowers—and for her statue of a handsome boy, which she loves to embrace. 2 She loved to hear about the upper world, the land above the sea. Q Why does the grandmother refer to birds as “fishes”? 3 As each princess reaches the age of 15, she will have permission to visit the upper world. Starting with the eldest, each promises to relate fully what she sees. 4 The youngest princess longs most of all to visit the upper world. Q In how many different ways is the youngest sister “special”? (You will need to think back or look back to Section 1 to fully answer this question.) Does the plot depend on the special characteristics of the youngest sister? ▲1 She was a strange child, quiet and thoughtful. While her sisters showed delight at the wonderful things which they obtained from the wrecks of vessels, she cared only for her pretty flowers, red like the sun, and a beautiful marble statue. It was the representation of a handsome boy, carved out of pure white stone, which had fallen to the bottom of the sea from a wreck. ▲2 Nothing gave her so much pleasure as to hear about the world above the sea. She made her old grandmother tell her all she knew of the ships and of the towns, the people and the animals. To her it seemed most wonderful and beautiful to hear that the flowers of the land had fragrance, while those below the sea had none; that the trees of the forest were green; and that the fishes among the trees could sing so sweetly that it was a pleasure to listen to them. Her grandmother called the birds fishes, or the little mermaid would not have understood what was meant, for she had never seen birds. ▲4 None of them longed so much for her turn to come as the youngest—she who had the longest time to wait and who was so quiet and thoughtful. Many nights she stood by the open window, looking up through the dark blue water and watching the fish as they splashed about with their fins and tails. She could see the moon and stars shining faintly, but through the water they looked larger than they do to our eyes. When something like a black cloud passed between her and them, she knew that it was either a whale swimming over her head, or a ship full of human beings who never imagined that a pretty little mermaid was standing beneath them, holding out her white hands towards the keel of their ship. 1 To the eldest sister, the finest thing was gazing on the town lights and listening to music and the lively sounds of the town. 2 A year later, the second sister told of the glorious sunset, the clouds, and the flight of wild swans. 3 The third and boldest sister swam up the broad river and saw green hills, palaces, and castles. She observed children playing in the water. 4 Oops! We forgot to summarize the experience of the fourth sister. But you can easily find out. 5 The fifth sister, visiting in winter, saw diamond-like icebergs, which vessels steered clear of, and thunderstorms, which terrified the sailors. 6 Gradually, the five sisters lost interest in the upper world. But at times they would sing to the sailors in passing ships. The Little Mermaid awaited her turn. Q In many fairy tales family members are mean to one another. One example is Cinderella. As you read, keep an eye on the five older sisters and see if they turn out to be mean to the youngest. Also, look for people in the story that might be considered "bad." ▲1 At length the eldest was fifteen and was allowed to rise to the surface of the ocean. ▲2 In another year the second sister received permission to rise to the surface of the water and to swim about where she pleased. She rose just as the sun was setting, and this, she said, was the most beautiful sight of all. The whole sky looked like gold, and violet and rose-colored clouds, which she could not describe, drifted across it. And more swiftly than the clouds, flew a large flock of wild swans toward the setting sun, like a long white veil across the sea. She also swam towards the sun, but it sank into the waves, and the rosy tints faded from the clouds and from the sea. ▲3 The third sister's turn followed, and she was the boldest of them all, for she swam up a broad river that emptied into the sea. On the banks she saw green hills covered with beautiful vines, and palaces and castles peeping out from amid the proud trees of the forest. She heard birds singing and felt the rays of the sun so strongly that she was obliged often to dive under the water to cool her burning face. In a narrow creek she found a large group of little human children, almost naked, sporting about in the water. She wanted to play with them, but they fled in a great fright; and then a little black animal—it was a dog, but she did not know it, for she had never seen one before—came to the water and barked at her so furiously that she became frightened and rushed back to the open sea. But she said she should never forget the beautiful forest, the green hills, and the pretty children who could swim in the water although they had no tails. ▲5 The fifth sister's birthday occurred in the winter, so when her turn came she saw what the others had not seen the first time they went up. The sea looked quite green, and large icebergs were floating about, each like a pearl, she said, but larger and loftier than the churches built by men. They were of the most singular shapes and glittered like diamonds. She had seated herself on one of the largest and let the wind play with her long hair. She noticed that all the ships sailed past very rapidly, steering as far away as they could, as if they were afraid of the iceberg. Towards evening, as the sun went down, dark clouds covered the sky, the thunder rolled, and the flashes of lightning glowed red on the icebergs as they were tossed about by the heaving sea. On all the ships the sails were reefed with fear and trembling, while she sat on the floating iceberg, calmly watching the lightning as it darted its forked flashes into the sea. ▲6 Each of the sisters, when first she had permission to rise to the surface, was delighted with the new and beautiful sights. Now that they were grown-up girls and could go when they pleased, they had become quite indifferent about it. They soon wished themselves back again, and after a month had passed they said it was much more beautiful down below and pleasanter to be at home. 1 When the Little Mermaid turned fifteen, her grandmother prepared her for her visit to the upper world, with oysters on her tail to show her high rank. 2 She approaches a large vessel, decorated with colored lights, where a handsome young prince was holding his birthday celebration. She cannot take her eyes from him. 3 A dreadful storm approaches and towering waves destroy the ship. 4 “He must not die!” Risking her own life, the Little Mermaid brings him to land. Q When the Little Mermaid brings the prince to shore, something happens that will have a huge impact on the story. What happens? Q Why is the Little Mermaid unhappy when she has just saved the life of the prince? As you will soon find out, life is about to get very complicated and difficult for our heroine. ▲1 At last she reached her fifteenth year. ▲2 The sun had just set when she raised her head above the waves. The clouds were tinted with crimson and gold, and through the glimmering twilight beamed the evening star in all its beauty. The sea was calm, and the air mild and fresh. A large ship with three masts lay becalmed on the water; only one sail was set, for not a breeze stirred, and the sailors sat idle on deck or amidst the rigging. There was music and song on board, and as darkness came on, a hundred colored lanterns were lighted, as if the flags of all nations waved in the air. It was very late, yet the little mermaid could not take her eyes from the ship or from the beautiful prince. The colored lanterns had been extinguished, no more rockets rose in the air, and the cannon had ceased firing; but the sea became restless, and a moaning, grumbling sound could be heard beneath the waves. Still the little mermaid remained by the cabin window, rocking up and down on the water, so that she could look within. After a while the sails were quickly set, and the ship went on her way.▲3 But soon the waves rose higher, heavy clouds darkened the sky, and lightning appeared in the distance. A dreadful storm was approaching. Once more the sails were furled, and the great ship pursued her flying course over the raging sea. The waves rose mountain high, as if they would overtop the mast, but the ship dived like a swan between them, then rose again on their lofty, foaming crests. To the little mermaid this was pleasant sport; but not so to the sailors. At length the ship groaned and creaked; the thick planks gave way under the lashing of the sea, as the waves broke over the deck; the mainmast snapped asunder like a reed, and as the ship lay over on her side, the water rushed in. ▲4 No, he must not die! So she swam about among the beams and planks which strewed the surface of the sea, forgetting that they could crush her to pieces. Diving deep under the dark waters, rising and falling with the waves, she at length managed to reach the young prince, who was fast losing the power to swim in that stormy sea. His limbs were failing him, his beautiful eyes were closed, and he would have died had not the little mermaid come to his assistance. She held his head above the water and let the waves carry them where they would. In the morning the storm had ceased, but of the ship not a single fragment could be seen. The sun came up red and shining out of the water, and its beams brought back the hue of health to the prince's cheeks, but his eyes remained closed. The mermaid kissed his high, smooth forehead and stroked back his wet hair. He seemed to her like the marble statue in her little garden, so she kissed him again and wished that he might live. Presently they came in sight of land, and she saw lofty blue mountains on which the white snow rested as if a flock of swans were lying upon them. Beautiful green forests were near the shore, and close by stood a large building, whether a church or a convent she could not tell. Orange and citron trees grew in the garden, and before the door stood lofty palms. The sea here formed a little bay, in which the water lay quiet and still, but very deep. She swam with the handsome prince to the beach, which was covered with fine white sand, and there she laid him in the warm sunshine, taking care to raise his head higher than his body. ▲5 Then bells sounded in the large white building, and some young girls came into the garden. The little mermaid swam out farther from the shore and hid herself among some high rocks that rose out of the water. Covering her head and neck with the foam of the sea, she watched there to see what would become of the poor prince. It was not long before she saw a young girl approach the spot where the prince lay. She seemed frightened at first, but only for a moment; then she brought a number of people, and the mermaid saw that the prince came to life again and smiled upon those who stood about him. But to her he sent no smile; he knew not that she had saved him. This made her very sorrowful, and when he was led away into the great building, she dived down into the water and returned to her father's castle. 1 She grows still more quiet and thoughtful. She returns to where she left the prince, but she never sees them. 2 Her only comfort is to put her arms around the marble statue in her garden, but, lovesick, she no longer tends the flowers. 3 Using Google Maps, she learns where the prince’s palace stands, and she now spends long hours observing him. Oops! There may have been a mistake in the previous summary statement. How does she learn where the prince's palace stands? Does this appear to be a big part of the story or just a detail to further the plot? 4 She is glad when she hears fishermen of the kingdom speaking well of the prince. ▲1 She had always been silent and thoughtful, and now she was more so than ever. Her sisters asked her what she had seen during her first visit to the surface of the water, but she could tell them nothing. Many an evening and morning did she rise to the place where she had left the prince. She saw the fruits in the garden ripen and watched them gathered; she watched the snow on the mountain tops melt away; but never did she see the prince, and therefore she always returned home more sorrowful than before. ▲2 It was her only comfort to sit in her own little garden and fling her arm around the beautiful marble statue, which was like the prince. She gave up tending her flowers, and they grew in wild confusion over the paths, twining their long leaves and stems round the branches of the trees so that the whole place became dark and gloomy. ▲3 At length she could bear it no longer and told one of her sisters all about it. Then the others heard the secret, and very soon it became known to several mermaids, one of whom had an intimate friend who happened to know about the prince. She had also seen the festival on board ship, and she told them where the prince came from and where his palace stood. “Come, little sister,” said the other princesses. Then they entwined their arms and rose together to the surface of the water, near the spot where they knew the prince's palace stood. It was built of bright-yellow, shining stone and had long flights of marble steps, one of which reached quite down to the sea. Splendid gilded cupolas rose over the roof, and between the pillars that surrounded the whole building stood lifelike statues of marble. Through the clear crystal of the lofty windows could be seen noble rooms, with costly silk curtains and hangings of tapestry and walls covered with beautiful paintings. In the center of the largest salon a fountain threw its sparkling jets high up into the glass cupola of the ceiling, through which the sun shone in upon the water and upon the beautiful plants that grew in the basin of the fountain. ▲4 Many a night, too, when the fishermen set their nets by the light of their torches, she heard them relate many good things about the young prince. And this made her glad that she had saved his life when he was tossed about half dead on the waves. She remembered how his head had rested on her bosom and how heartily she had kissed him, but he knew nothing of all this and could not even dream of her. Q Can you make a good guess about H.C. Andersen's religious beliefs? Q In this part of the story the Little Mermaid learns things that change her life forever and make her dissatisfied with the life she had been expecting to live. Does this happen to people today? 1 That evening the Little Mermaid cannot enjoy the court ball. She resolves to risk all to win the prince and an immortal soul. 2 She follows an unfamiliar road into the land of the sea witch. Q What is this road look like? What does the Little Mermaid find there? How does the appearance and other aspects of the road contribute to the story? 3 In terror, she darted past the deadly, grasping tentacles of the sea polyps. Their slimy tentacles held human skeletons and even the remains of a mermaid they had seized. 4 Finally, she found the ghastly home of the sea witch, who had a pet toad eating from her mouth. The witch knew why she’d come. 7 The Little Mermaid accepted all these terms, even the loss of her tongue, and made her way back toward her father’s castle. Q We think that the witch makes a surprising comment in this part of the story. In fact, we think it's quite funny. Do you see a detail here that readers might consider humorous? ▲1 It was one of those splendid sights which we can never see on earth. The walls and the ceiling of the large ballroom were of thick but transparent crystal. Many hundreds of colossal shells,—some of a deep red, others of a grass green,—with blue fire in them, stood in rows on each side. These lighted up the whole salon, and shone through the walls so that the sea was also illuminated. Innumerable fishes, great and small, swam past the crystal walls; on some of them the scales glowed with a purple brilliance, and on others shone like silver and gold. Through the halls flowed a broad stream, and in it danced the mermen and the mermaids to the music of their own sweet singing. ▲2 Then the little mermaid went out from her garden and took the road to the foaming whirlpools, behind which the sorceress lived. She had never been that way before. Neither flowers nor grass grew there; nothing but bare, gray, sandy ground stretched out to the whirlpool, where the water, like foaming mill wheels, seized everything that came within its reach and cast it into the fathomless deep. Through the midst of these crushing whirlpools the little mermaid was obliged to pass before she could reach the dominions of the sea witch. Then, for a long distance, the road lay across a stretch of warm, bubbling mire, called by the witch her turf moor. ▲3 Beyond this was the witch's house, which stood in the center of a strange forest, where all the trees and flowers were polypi, half animals and half plants. They looked like serpents with a hundred heads, growing out of the ground. The branches were long, slimy arms, with fingers like flexible worms, moving limb after limb from the root to the top. All that could be reached in the sea they seized upon and held fast, so that it never escaped from their clutches. ▲4 She now came to a space of marshy ground in the wood, where large, fat water snakes were rolling in the mire and showing their ugly, drab-colored bodies. In the midst of this spot stood a house, built of the bones of shipwrecked human beings. There sat the sea witch, allowing a toad to eat from her mouth just as people sometimes feed a canary with pieces of sugar. She called the ugly water snakes her little chickens and allowed them to crawl all over her bosom. ▲5 “I know what you want,” said the sea witch. “It is very stupid of you, but you shall have your way, though it will bring you to sorrow, my pretty princess. 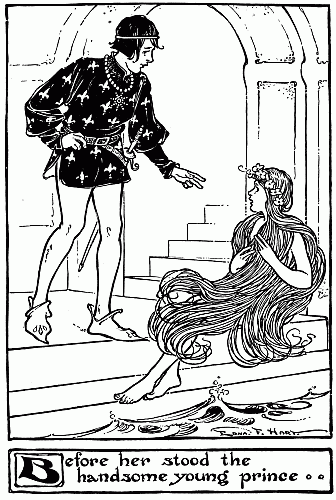 You want to get rid of your fish's tail and to have two supports instead, like human beings on earth, so that the young prince may fall in love with you and so that you may have an immortal soul.” And then the witch laughed so loud and so disgustingly that the toad and the snakes fell to the ground and lay there wriggling. ▲7 “It shall be,” said the little mermaid. “There it is for you,” said the witch. Then she cut off the mermaid's tongue, so that she would never again speak or sing. “If the polypi should seize you as you return through the wood,” said the witch, “throw over them a few drops of the potion, and their fingers will be torn into a thousand pieces.” But the little mermaid had no occasion to do this, for the polypi sprang back in terror when they caught sight of the glittering draft, which shone in her hand like a twinkling star. 1 Passing her father’s castle, she says a silent farewell to her family and joins the prince at his palace. 2 She takes the potion and accepts the pain. Delighted with her grace and beauty, the prince welcomes her to court. Everyone is enchanted when she dances. Q What is the social status of the singers and dancers that perform at court? Are you surprised? Do you think H.C. Andersen expected intended to do anything controversial when he made this artistic decision? 3 She becomes the prince’s beloved companion, but he loves her as a child. 4 The prince reveals that he can love and marry no one but the girl that (he thinks) saved him from the shipwreck. But since she belongs to the holy temple, he does not expect to marry. 5 The Little Mermaid almost cries because because the prince does not know that it was she who saved his life. But If the prince cannot marry, the Little Mermaid will gladly devote herself to caring for him. ▲1 So she passed quickly through the wood and the marsh and between the rushing whirlpools. She saw that in her father's palace the torches in the ballroom were extinguished and that all within were asleep. But she did not venture to go in to them, for now that she was dumb and going to leave them forever she felt as if her heart would break. She stole into the garden, took a flower from the flower bed of each of her sisters, kissed her hand towards the palace a thousand times, and then rose up through the dark-blue waters. ▲2 The sun had not risen when she came in sight of the prince's palace and approached the beautiful marble steps, but the moon shone clear and bright. Then the little mermaid drank the magic draft, and it seemed as if a two-edged sword went through her delicate body. She fell into a swoon and lay like one dead. When the sun rose and shone over the sea, she recovered and felt a sharp pain, but before her stood the handsome young prince. He fixed his coal-black eyes upon her so earnestly that she cast down her own and then became aware that her fish's tail was gone and that she had as pretty a pair of white legs and tiny feet as any little maiden could have. But she had no clothes, so she wrapped herself in her long, thick hair. The prince asked her who she was and whence she came. She looked at him mildly and sorrowfully with her deep blue eyes, but could not speak. He took her by the hand and led her to the palace. ▲3 The prince said she should remain with him always, and she was given permission to sleep at his door, on a velvet cushion. He had a page's dress made for her, that she might accompany him on horseback. They rode together through the sweet-scented woods, where the green boughs touched their shoulders, and the little birds sang among the fresh leaves. She climbed with him to the tops of high mountains, and although her tender feet bled so that even her steps were marked, she only smiled, and followed him till they could see the clouds beneath them like a flock of birds flying to distant lands. While at the prince's palace, and when all the household were asleep, she would go and sit on the broad marble steps, for it eased her burning feet to bathe them in the cold sea water. It was then that she thought of all those below in the deep. 1 The Little Mermaid joins the prince when he visits a neighboring king. His subjects speculate that he plans to marry the king’s daughter. 2 The king’s daughter appears: She is the one who found the prince on the shore after the shipwreck. No longer in the temple, she is free to marry. 3 The Little Mermaid joins the wedding festivities and holds the train of the bride’s gown. But with his marriage, she faces imminent death and no chance at immortality. Q Even though this is a very “unrealistic” story, the emotions of the characters are very real and affect us deeply. What are the thoughts and feelings of the prince in this part of the story? What are the Little Mermaid's thoughts and feelings regarding the prince, her family, the princess, her own situation? ▲1 Very soon it was said that the prince was to marry and that the beautiful daughter of a neighboring king would be his wife, for a fine ship was being fitted out. Although the prince gave out that he intended merely to pay a visit to the king, it was generally supposed that he went to court the princess. A great company were to go with him. The little mermaid smiled and shook her head. She knew the prince's thoughts better than any of the others. In the moonlight night, when all on board were asleep except the man at the helm, she sat on deck, gazing down through the clear water. She thought she could distinguish her father's castle, and upon it her aged grandmother, with the silver crown on her head, looking through the rushing tide at the keel of the vessel. Then her sisters came up on the waves and gazed at her mournfully, wringing their white hands. She beckoned to them, and smiled, and wanted to tell them how happy and well off she was. But the cabin boy approached, and when her sisters dived down, he thought what he saw was only the foam of the sea. ▲2 The next morning the ship sailed into the harbor of a beautiful town belonging to the king whom the prince was going to visit. The church bells were ringing, and from the high towers sounded a flourish of trumpets. Soldiers, with flying colors and glittering bayonets, lined the roads through which they passed. Every day was a festival, balls and entertainments following one another. But the princess had not yet appeared. People said that she had been brought up and educated in a religious house, where she was learning every royal virtue. ▲3 All the church bells rang, and the heralds rode through the town proclaiming the betrothal. Perfumed oil was burned in costly silver lamps on every altar. The priests waved the censers, while the bride and the bridegroom joined their hands and received the blessing of the bishop. The little mermaid, dressed in silk and gold, held up the bride's train; but her ears heard nothing of the festive music, and her eyes saw not the holy ceremony. She thought of the night of death which was coming to her, and of all she had lost in the world. 1 Her sisters appear with a knife. They have sold their hair to the sea witch. If the Little Mermaid will slay the prince, she will live. Q Earlier (Section 3), we asked you to look for instances of bad (immoral) behavior in the story. What do you think of the sisters? What do you think of the witch? 2 The Little Mermaid draws back the curtain on the sleeping couple. The knife trembles in her hand—but she throws it into the sea. Q The Little Mermaid has an obvious motive for killing the prince—saving her life. But what thoughts and feelings are in her mind when she holds the knife over the prince? 3 She leaps into the sea. She feels her body dissolve into the foam. All was joy and gaiety on the ship until long after midnight. She smiled and danced with the rest, while the thought of death was in her heart. The prince kissed his beautiful bride and she played with his raven hair till they went arm in arm to rest in the sumptuous tent. Then all became still on board the ship, and only the pilot, who stood at the helm, was awake. The little mermaid leaned her white arms on the edge of the vessel and looked towards the east for the first blush of morning—for that first ray of the dawn which was to be her death. ▲1 She saw her sisters rising out of the flood. They were as pale as she, but their beautiful hair no longer waved in the wind; it had been cut off. ▲2 The little mermaid drew back the crimson curtain of the tent and beheld the fair bride, whose head was resting on the prince's breast. She bent down and kissed his noble brow, then looked at the sky, on which the rosy dawn grew brighter and brighter. She glanced at the sharp knife and again fixed her eyes on the prince, who whispered the name of his bride in his dreams. ▲3 She was in his thoughts, and the knife trembled in the hand of the little mermaid—but she flung it far from her into the waves. The water turned red where it fell, and the drops that spurted up looked like blood. She cast one more lingering, half-fainting glance at the prince, then threw herself from the ship into the sea and felt her body dissolving into foam. 1 The Little Mermaid realizes she is still alive. She sees hundreds of beautiful creatures floating around her. She is now one of them. Their speech is heavenly music, as is her own. 2 She has joined the Daughters of the Air. Now through good deeds she can, after 300 years, win an immortal soul. Through her suffering, endurance, and goodness, the Little Mermaid has raised herself to the spirit world. Q What are the good deeds that the Daughters of the Air do to earn immortality? 3 Meanwhile, the prince and his bride look sorrowfully into the sea mourning the death of the Little Mermaid. Taking fond leave of the royal couple, the Little Mermaid mounts to a rosy cloud. Q Do you think that the Little Mermaid has earned an immortal soul? How many times in the story does she take a risk or accept suffering for the sake of the prince? 4 Each time the Daughters of the Air find a good child, their probation is shortened by a year. Each time they encounter a naughty or wicked child, a day is added. ▲1 The sun rose above the waves, and his warm rays fell on the cold foam of the little mermaid, who did not feel as if she were dying. She saw the bright sun, and hundreds of transparent, beautiful creatures floating around her—she could see through them the white sails of the ships and the red clouds in the sky. Their speech was melodious, but could not be heard by mortal ears—just as their bodies could not be seen by mortal eyes. The little mermaid perceived that she had a body like theirs and that she continued to rise higher and higher out of the foam. “Where am I?” asked she, and her voice sounded ethereal, like the voices of those who were with her. No earthly music could imitate it. ▲3 On the ship in which she had left the prince there were life and noise, and she saw him and his beautiful bride searching for her. Sorrowfully they gazed at the pearly foam, as if they knew she had thrown herself into the waves. Unseen she kissed the forehead of the bride and fanned the prince, and then mounted with the other children of the air to a rosy cloud that floated above.